There’s another new paper from the the UW Massive Stars research group! This one is led by Trevor Dorn-Wallenstein, a fourth-year graduate student and has recently been accepted for publication in the Astrophysical Journal. The research uses the BPASS models of binary stellar evolution to simulate entire populations of stars with various binary fractions. Based on these simulations, Trevor has identified diagnostics based on stellar populations (values like the RSG/WR population ratio) that can be used as sensitive measures of things like age and binary fraction for a population of massive stars. There’s also a tentative but really compelling potential link between the binary fraction and metallicity! This is the first paper published by Trevor as part of his PhD thesis – future work will look at observational counterparts to these simulations, as well as other research on massive stars ranging from individual stellar spectra to large-scale big data studies. You can read the in-press version of the paper on arXiv to learn more about this work! 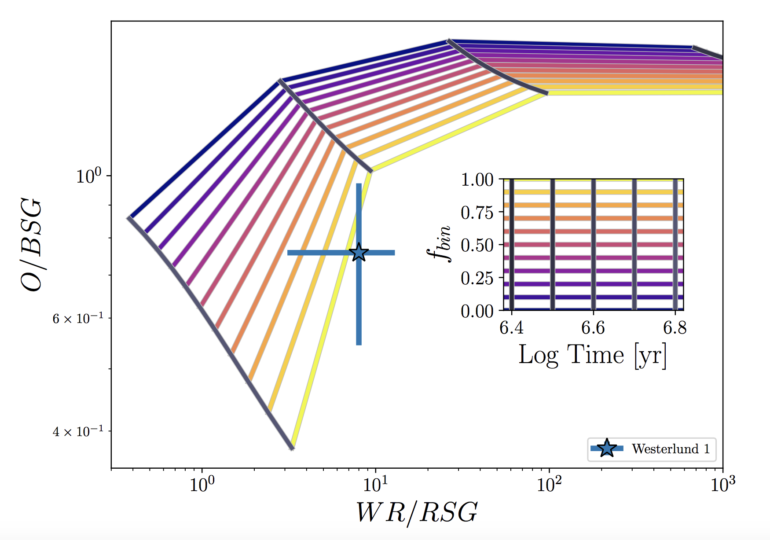 New paper: near-IR photometry of red supergiants with JWST!